This form is used by an agent when an offer or counteroffer for the purchase or lease of property is received and rejected by the client, to prepare a counteroffer on modified terms. reviewing different terms or conditions sought by the seller from those offered by the buyer. Further, a counteroffer allows the seller’s agent to eliminate contingency provisions in the buyer’s offer regarding disclosures. Also, the seller’s agent takes steps to establish the buyer’s qualifications for any purchase-assist financing requirements and the source of other funds needed by the buyer to close the transaction. The environment surrounding the agent’s analysis of the buyer’s offer and review of the offer with their seller is nearly always within the control of the seller’s agent. The agent uses the opportunity to sort through the paperwork before the seller enters into a binding contract and fixes expectations by all participants about the terms of the agreement and condition of the property. A prompt, initial review of the buyer’s offer by the seller’s agent — alone and before meeting with the seller — is necessary for the agent to properly prepare for submitting, reviewing and advising the seller on the financial and legal consequences of accepting the offer. what amount will the seller receive in net sales proceeds. increase the seller’s transactional-closing costs when the buyer demands that the seller eliminate previously undisclosed and unacceptable conditions first brought to the buyer’s attention due to a delayed disclosure or discovery. a discussion about the agent’s knowledge of the formulas for profit tax liability the seller is likely to incur on the sale, when the property is other than one-to-four residential units. For example, an agent representing a prospective buyer submits a purchase agreement offer on the property without first requesting a copy of the marketing package from the seller’s agent for review with their buyer. Here, the buyer does not take into consideration any adverse property conditions disclosed in the marketing package when the buyer made their decision about the price and terms they are willing to pay to buy the property. A marketing package contains all the property disclosures the seller and seller’s agent are required to deliver to a prospective buyer at the earliest opportunity — either on request, and always before an unconditional acceptance of an offer or counteroffer. Further, pre-contract property disclosures eliminate most of the contingencies which affect the price, the amount of the seller’s transactional expenses or the buyer’s ability to cancel the purchase agreement. The seller’s agent handling negotiations for a change in the terms of the buyer’s purchase offer needs to reduce the seller’s (counter) offer to a writing signed by the seller before it is submitted to the buyer. Without the seller’s signed counteroffer, the seller has not manifested their intent to be bound by their offer to sell. Here, the buyer needs a writing so they can accept and enter into a binding agreement, not an oral arrangement carried out by the transaction agents. Signatures: The person making the counteroffer signs and dates the counteroffer. The brokers sign the counteroffer to acknowledge their participation in negotiations. The rules for preparing, submitting and accepting a counteroffer in a real estate sales transaction are the same rules applied to determine whether an offer made by a buyer has been submitted to the seller and an acceptance by the seller has occurred to form a binding agreement. Real estate agents instinctively consider submitting written offers from a buyer to a seller, rather than an oral offer, to comply with the rule requiring a written agreement that is signed by the buyer and seller to form a binding real estate agreement. Likewise, when the seller will not unconditionally accept all aspects of the buyer’s offer but is willing to commit themselves to different terms for a sale, their agent is faced with a counteroffer situation and needs to instinctively prepare and submit a written counteroffer for the buyer to accept or reject. On the buyer’s receipt of a seller’s counteroffer, the buyer might not accept the terms stated in the counter but still be willing to purchase the property on different terms — a counter to the counter. The buyer’s counteroffer, by reference, includes all the terms and conditions of the seller’s counteroffer, which references and includes all the provisions in the buyer’s original offer. 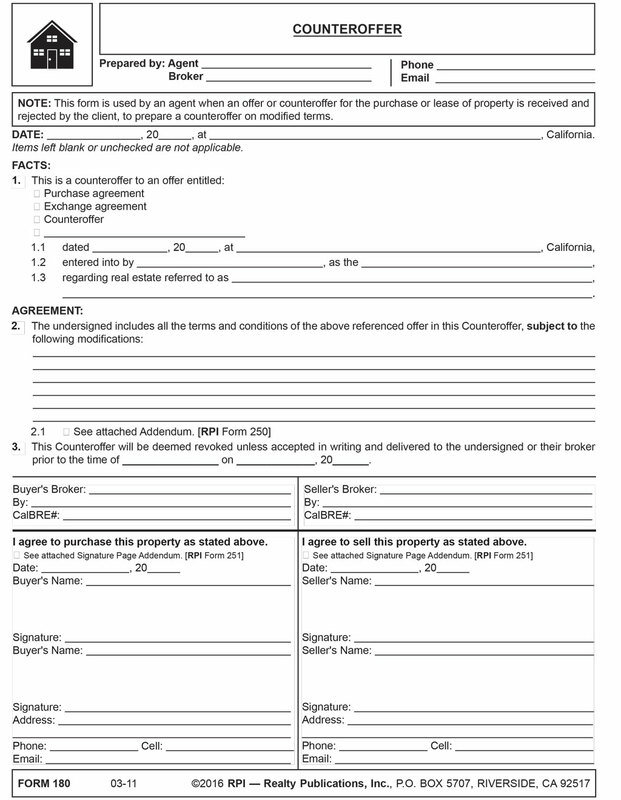 These referenced terms from the seller’s counter are then modified by entry on the counteroffer form of the buyer’s terms and conditions contrary to those sought by the seller. Alternatively, the buyer’s agent may prepare an entirely fresh offer on a purchase agreement form setting forth the terms agreeable to the buyer. Forms for entering into agreements — signing — are usually worded flexibly to merely reflect that the buyer and seller agree to the terms stated above. The wording eliminates concern over whether the buyer or seller is to first sign a purchase agreement or counteroffer form. Either may sign first, which makes it their offer for the other’s acceptance on the terms stated. Form updated 05-2016 to include the Form Description at the top, white header/footer convention and RPI branding. Form navigation page published 04-2018.